I knew it as Doordarshan but now it is known as DD. There are various channels of DD at present, DDNational, DDsports, DDNews, DDIndia and DDBharati. 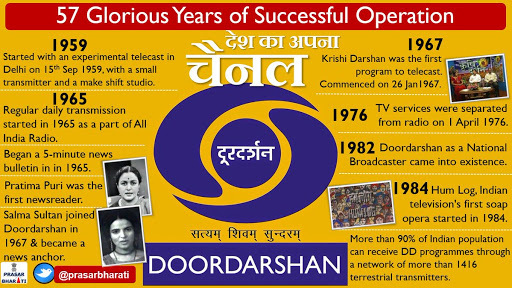 It has been a journey of 57 years for doordarshan. I don’t know who coined this name for our National TV, but it was perfect choice for national TV. In those days very often it so happened in almost all Sunday movies that this caption used to be shown in middle of scenes. That time all of us used to curse the doordarshan. Sometimes when cricket match was telecasted and if this caption came, all of sudden students started crying loudly and started making sounds. Luckily we carried over that period and passed on to a new chapter when there was news that a Metro channel is coming. 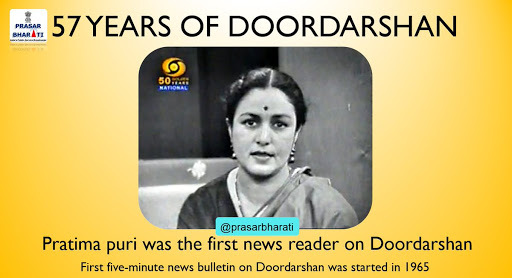 It was for two hour special channel on Doordarshan. Then in 1982 the INSAT thing happened and we got a National Telecast in a real sense. Our late Prime Minister Smt Indira Gandhi ji asked the Capt. Rakesh Sharma when he was in the spacecraft above in the sky, that how does our India looks like? He without any hesitation replied that lkjs tgkaW ls vPNk Sare Jahan se Accha. To this reply Smt Indira Gandhi also laughed. All this happened in front of our eyes. Whole nation enjoyed. Asian, National games-Bhartiyam, CHOGM, NAM, SAARC all started happening on the screen in our houses. Nothing of that sort ever happened before. All this happened in COLORs, earlier all we saw was in black and white screen. In my house TV came in 1982. There was this program on Immortal melodies Immortal stars. All old stalwarts came on screen, Rajkumari ji, Noorjahan came to India and sang vokt ns dgka gS rw nqfu;ka rsjh tokWa gS Great Naushad sahib conducted the song. As it seems, that time stood still. Earlier when there was only one TV in whole colony, all children used to hang on to the window of that house. Those who were close to that family were lucky and saw the TV from inside of the room. But I was a weak child, I got the chance to hang in the window iron bars and sometimes I was not even given that opportunity also by the mighty boys of our colony. Those were very bad times for me. I used to think why this TV is not in my house. But then how could we ask such questions to our papa ji? We did not have tape recorder, not even a camera? But yes we had a Radio. It was a big one named as PIE. It was from UK I think? My father was in Indian Navy. He was in the team which was sent to England to bring back the INS Vikrant to India. That time my father might have bought that PIE Radio, I think? Later we used to walk for 1 km from type one in IIT Kanpur campus to type two to watch Sunday movie in house of Mathurs. I am gratefull to Mathur family. They did permit us to watch TV sitting in their drawing room. It was a great thing on their part in those days. Yes it was a great emotional thing. I had been scolded many times in some houses, as to not to touch those sofa covers. While watching TV, As it happened in ecstasy sometimes I forgot my poor existence and might have put my hand on sofa cover, and it got some wrinkles. That was enough to get a scolding from the lady of house. It was quite OK for me. It was not a big price to pay in lieu of watching that idiot box?? Isn’t it? But time passed on From 1976 to 1982. But in this journey i came to know lot of great souls of India. Our Bharat Ratna a great soul, a Divine Singer Smt MSubbulakhsmi one such persona. Even in 1982 many households did not own a TV. In villages, where i visited during summer and winter holidays (vacations) not many had even a Transistor. Few enthusiastic youths and few landlords had Transistors. They had nice colorfull covers, nicely woven by the ladies of households. The cricket match was the prime objective for transistors among young. News/Samachar and some film songs were the attraction for rich people. Later even rickshaw pullers also had transistors nicely tied on to their handles or specially designed hangers on cycle or rickshaws. In bus also i saw good arrangements were made to hang Transistors. 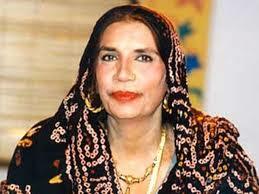 Even during the time of Reshma ji, she did not know much about Radio. After lots of reluctance she was allowed to sing on Radio. 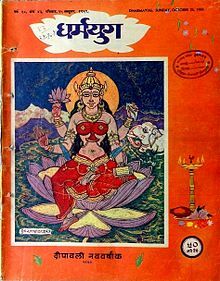 Illustrated weekly, Kadambini, Navneet, Sarita, chandamama, Amar chitra katha, parag, chandan or nandan? gudiya, for various needs of Knowledge, entertainment etc. Later i also had Vama, Femina, Frontline, Reader Digest and few other magazines for my reading. I used to read books of famous Shivani ji (Gaura Pant), Acharya Chatursen, Premchand, AmritLal Nagar etc. Newspapers were also there- Hindustan Times, Times of India, Aajtak, Dainik Jagran. we all grew up reading all this. But when this TV came all of sudden our world diminished and coiled into that idiot box. Why that was called as idiot Box? Through Doordarshan really i got darshan of far off places. I got to see films in Malayalam, Tamil, Kannada, Gujarati, Rajasthani, Marathi, Manipuri, Bengali, Punjabi, Assamese, Telugu, Bhojpuri, Oriya, i doubt whether there was any film in Kashmiri? back then. 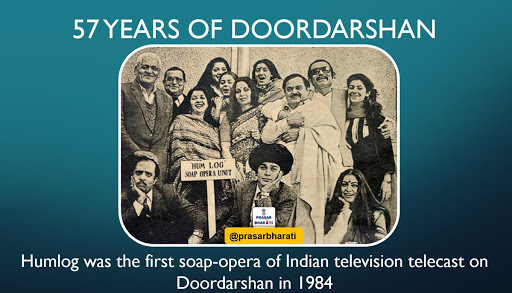 Till 1990 i kept watching doordarshan at my home. i had seen Sagar Sangamam, Sindhu Bhairavi, Agni Nakshatram, But i liked the most was the film Sankarabharnam. Then there was my fav star a super star, most creative person i have ever seen after V Shantaram ji was NTR NT Rama Rao. All of his films shown on Doordarhsan were superb. Daanveer Karna, where he wore most artistic Shoes and walking in the compound of palace of pandavas, when he placed foot on the floor, the camera NTR used there was most innovative. One has to see himself to appreciate that angle of camera? SitaRama Raju. where he played role of the fighter. Then there are many such films where NTR played role of Krishna, Vishnu etc. All films were artistically superb, Each Frame of his films were like paintings. Just like most of the films of V Shantaram were like a work of Painted canvas. He was a creator of art. I don’t remember how many films were shown on DD in Telugu, but most of them i saw were of NTR. Then there was Tamil films, Shivaji Ganeshan, and MGR etc. The film in which Shivaji played a mythological? role where he was fighting with his own son. But he did not know that fact. later somewhere during fight or after that he was told that fact. Then there was a film in which heroine was staying in her sister’s house and during absence of her sister she went to her bedroom. But in Night the hero came and unforgettable thing happened. Hero thought that lady was his wife. Then in one film the heroine is a district collector and the hero is a simple govt employee. The films of Padmini, the gem of Travancore sisters. this dance sequence where i think MGR was there, and went to see the dance of heroine in disguise, as if nobody could see them. there were so many. few were shown of Vaijayantimala in Tamil also. Padmini played a dancer role. The famous film in which Kamal Hassan worked with Jayaprada. He had some dance scenes. Bombay i saw in Malayalam. But later it was also in Hindi. With the journey of Doordarshan i came to know about many stalwarts and GEMs of India and Indian Music. The Gauhar Jaan was the star of her times. She was a Super star celebrity of her times compared to present times celebrity, she was more highly paid and commercially successful. There were few good programs on our rich tradition of Music also. Smt N aina Devi ji was the permanent feature in many such programs on Doordarshan. There were many such vidushis. Like Sidheswari Devi, Girja Devi, Rasoolan Bai, Asgari Bai, later Begum Akhtar became the star attraction on Doordarshan. There was Savita Devi, Shobha Gurtu, Usha Uthup though apposite genre of music but both captivated audiences through their music, Doordarshan telecasted their programs. RukminiDevi Arundale and dances choreographed by her came on Doordarshan. my fav NTRama Rao, in SitaRamRaju?? So Doordarshan was one medium through which i learnt about India from Arunachal Pradesh, Ladakh, Leh, Gilgit, Kanyakumari, Kucth. Through Doordarshan i came to know about our rich heritage of Indian Music & Arts. Jammu to Kanyakumari. There was one program on DD i heard, few folk singer were singing some of their folk songs but it was said they sounded like hymns of Veda? The known to all story of Ashoka is very different to what is being currently shown on the Colors TV. The most surprising was the Amma ji of serial “Lado na aana is desh”. The Character of Amma ji was larger than life. But we do not complain since the TV serial or Natak to be exact should be filled with Drama. Unless a natak doesn’t has a drama element it is not complete. The character had an IMPACT, that will remain with me throughout my life. Now this Ashoka has started with aplomb. First few episodes were the best, As it happens with every serial. When I saw that serial runs for whole one hour. I was so engrossed with the idea that “now atleast a serious TV serial producer has born” The most incredible thing was that serial ran full for one hour without any break or commercial advertisement. Some serials were made only for commercial advertisement purpose. But when I found that there is no break I felt happy at heart. And thought to appreciate the producers. But mummy of Jaivardhan cursed the producers as now for whole one hour my son had to sit in front of TV and that too without any break. His final exams were approaching and we all were encouraging him to work hard and prepare for his exams. But now this Ashoka came and he would sit in front of TV for full one hour. I was happy that at last some serial has come with serious agenda to highlight the ancient Indian civilization and help it to regain its glory. As once did the Ramayan and Mahabharat. The history of TV will be not without these two serials. History was made by HUMLOG. Then there were TAMAS, BUNIYAAD. When Ashoka was aired without any break I thought history has been made. But I was proved wrong very shortly there after. Much to relief of mummy of Jaivardhan, my son. The Chanakya has come in a new Avatar. The writer, screen play writer, the director, The dialogue writer, the set designer, casting director (I don’t know whether casting director had any role in it ?) all are to be praised. Initially the Rani Dharma, Ashoka emerged as hero. Artists did full justice to their roles. The serial is best as of today as I found, be it concept, costume, DRAMA, suspense, Screen play, artists. Actor who has played the role of Chanakya has actually tried to go deep into the characterization. The dialogue rendition is very good. Credit can also be given to editing. The set designing reminds me the sets of Bharat Ek Khoj by Shyam Benegal, (I don’t remember if Nitin Desai was there). And then there was CHANAKYA by the “chanakya” Prakash chandra Dwedi ji. The artist playing Chanakya is to be praised for his acting. SUPERB. Every act of his face is doing justice to the role. I have never seen such portrayal by any artist before. I can say only Meena Kumari and Nutan were two artists to name few. I liked. The ashoka serial people have done lot of research on the topic. I think TV has got or invented a “KING”. He looks like a king(Not many can). He was first seen in Rani Laxmi Bai. He played the role of king of Jhansi who married laxmi bai. Then he played the role of King Shuddhodhan, father of Gautam Budhdha of Kapilvastu. He played the role effortlessly. His gait and mannerism are shown like of a king. I could guess that he is a Marathi actor, due to his accent. The fact that mother and Ashoka was not known to Bindusaar while they continued to ive in Patliputra was new to me. She was a daughter of a Shresthi of Ujjain, who followed the JAIN or jeevak (or pra jeevak) lifestyle and/or similarly the wife of Ahoska was also from a Shresthi of Ujjain.?? I don’t know?. But in TV i think they have shown Rani Dharma (Shubhadrangini) as daugtherof Brahmin. 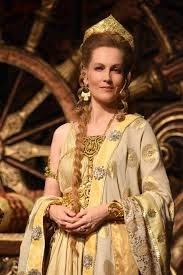 Till today I had never seen “Helena”, the daughter of Selucus. Although I knew through the history lessons about that marriage, but never seen in TV or films. She was married to Chandra Gupt. Culture were different. Language might have been a great barrier. Isnt it? Interpreters were engaged or not? God knows? Her son was also there, a completely new information for me. Not much was known to me about the Charumitra the first wife of king Bindusaar. The status of Chanakaya was larger than anything else. Once, a dwarpal was ordered not to let anyone enter without permission. Later Chanakya stood at the gate. On recognizing the Chanakya, the dwarpal did not stop him from entering the palace. 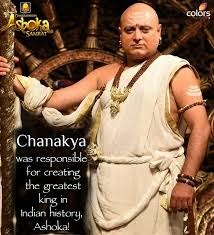 Since Chanakya had acquired a status larger like a king or kingdom. His devotion and faithfullness towards the Magadh- the mother land was quite extraordinary and well known throughout the kingdom. Even Kings could not disagree on that. As we write in ACR- the appraisal forms for the integrity- Beyond doubt… often blindly we write it there. The Chanakya is also said to have mobilized all persons loyal to the Magadh and brought them together to work for the King. Even if they personally did not agree with Chanakya. That’s the true character of Chanakya. He wanted people who will work for Magadh not for a person, and not for their personal gains. A true lesson for today. He brought back the Rakshash. Now I have started appreciating the acting of the lady playing the role of Helena. The screen presence(as we call it) combined with the background music spells magic. I am thinking who this expert lady is? Is she an Indian (anglo-indian) or a foreigner? If she is not from India then hats off to her courage and caliber.. She is a true drama artist. The face of cuckoo of old Hindi films comes to mind. But few of her gestures suggest that she if from other nation. But when she emotes and conveys the emotions through facial gestures it becomes difficult to imagine that lady actor do not understand the hidden meanings of words of Hindi? Though the accent has been kept un-indian..That actually justifies the acting. However as good serial. Looks authentic, and looks appealing too. That’s what is required for a good serial. Malati Shyam- The announcer on TV was saying and I was thinking about my guru who is currently teaching at Kathak Kendra, New Delhi in my mind space. But when the dance program started then I came to know that it was about Malati Shyam. Though age has started showing itself, But on screen the image was looking similar to my guru Prerna Srimali. I have seen unlimited programs of Malati Shyam in between 1983 to 2000. She alongwith the troupe of Pt Birju Maharaj had visited Kanpur many times. Then she was known as Malati Rawat. When I saw the program on TV (means Doordarshan, as that time only DD was available to us, thus name stuck with our mental space) today The background was well decorated. When I found the name of Gangani missing from the accompanying artists something struck to the mind at that very moment. Actually one gangani (If I am correct Fateh gangani) was the permanent figure in the accompanying group with most of the teams of Maharaj ji. Or so to say the Kathak Kendra had him permanently. Durga Arya, Aditi, Malati Rawat, Saswati Sen, Jaishree Acharya, Sharmistha etc to name few were always part of team of Maharaj Ji. And this team had many times performed in Kanpur. At our IIT Kanpur campus also some of the team members had performed. One student of Kathak Kendra was Veronic Azan who had also performed at IIT Kanpur. I had seen Smt Prerna Srimali at Merchant Chamber Hall, Kanpur. That time I had beard, it was impact of being an Unemployed person, with little or no resources with me. I had touched her feet as was the tradition which I blindly followed. I saw her in person the year1986 or so, little did I knew that I would be her student in future. When I touched her feet at Merchant Chamber Hall, Kanpur, she exclaimed “what are you doing” knowing that a beard man touching her feet. She herself was a young artist. She had uttered the word “AAP”. It was due to my beard that she had addressed me with that word. In future I got the chance to learn from her in the Gandharv Mahavidyalaya, New Delhi. Here also I was a failure, after two years I got a job in another city and I had to leave Delhi and I could not utilize that phase of my life. Like a Chaatak, I remained thirsty all my life. I accidently switched on the TV it was national channel. Two ladies were dancing. The music was sounding like Hindustani. The attire of both the dancers was just replica of what dancers of Kathak Kendra or dancers at Delhi wear. They have popularized this dress all over the India. Then suddenly I heard a song in somewhat sounding like Odissi language. Then after listening for few minutes it certainly sounded like Assamese. First there was a thumri in Hindi, then some portion sounded like verses of any gazal. Then I heard the famous thumri, on which late Pt Durgalal once performed on TV. This imaginative creation caught my attention. This is a good example how one can crate beautiful things. There was Thumri, there was abhinay. The dancer duo were looking sisters, as I guessed. But I was proved right when their names were flashed on the tv screen. Earlier in many programs I had never seen names flashed as they did in this program. Their names were Aligunjan and Chandrani Kalita. Names were very unusual to me. The duo had selected the attire of Delhi Kathak. But they changed the fabric and color of dress,. This duo from Assam did choose some heavy designed fabrics and with heavy colors. The background was very simple and minimalist. At first I thought they are dancing in some library kind of place. In background some almirah with glass panes were there. In between the design (painting) of pillars with very minimum engraving stood. The Lord Natraj were there standing at the last point of the floor. When dancers were dancing and trying to utilize the space then they reached at the last point of the stage, almost stepping on to the lord’s image. That means the space was less for their dance. Choreography was also lacking synchronization/coordination at some points. I thought in my mind that this dance must have been choreographed by these dancers themselves and not by their guru- whoever guru was(I don’t know). Many steps lack imagination and looked very animated, As if not coming naturally. While dancing for a tarana at Kamani Auditorium New Delhi for the annual function of Gandharva Mahavidyalaya, New Delhi, my guru (Smt Prerna Srimali) told us that synchronization is very much important in a group performance. If two dancer take a chakkar on one side and the third takes it in different side or one more or one less then whole impact of the group gets lost. Same thing came to my mind when one dancer was missing some steps and trying to match with the other dancer on many steps. That looked many times awkward. I know since it has happened with me also many times on stage. Then in last they danced on teen tal, but on TV screen the spelling was “Tin Tal Drut lay” Both danced quite well. Initially I was thinking that they belonged to the school of Khairagarh. Do you know who is credited to have started this school. If I am correct, Kudau Singh has been credited for it. He was a Pakhawaj player. As I read somewhere that when he was jailed for some time, he practiced the pakhawaj playing on the pillars. And his strong fingers made dints in the pillars. That was the impact of strength and grit and determination, strict discipline of practice.